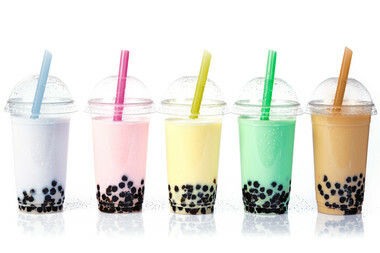 Summer is the best time for a bubble tea treat! Summer in NYC is the perfect time for trying all the different varieties of frozen desserts, cold drinks and seasonal fruit flavors at different shops. And it's also an ideal time to try refreshing milk and bubble teas. This Queens joint has a variety of cold tea-based drinks that are flavorful but light enough for the summer. Their bubble teas, with flavors including piña colada and durian, are served either cold, plain, or with a free topping of your choice, like flavored jellies and puddings. You can also specify the amount of sugar you get in your tea. This store boasts fresh, high-quality Chinese teas. They use powdered teas, not condensed syrups, and that makes for a smoother flavor. Apart from just serving regular milk teas, this cafe offers flavors like earl grey, lychee apple aloe and Thai milkshake. They also have soy milk for customers prefer that to regular milk. There are also toppings like herbal jellies along with the usual boba. This Taiwanese bubble tea chain has locations all over NYC, and they serve up all kinds of tea flavors and toppings like fresh fruit, whipped cream, sweet red bean and herbal jellies. Teas can be ordered with a customized amount of sugar and ice, and with or without milk depending on the flavor. Anyone looking for fresh teas and seasonal flavors should definitely give Teado a try. The expansive menu includes flavors like jasmine oolong, red plum and chrysanthemum. They use Lactaid milk for any lactose intolerant patrons, and like many shops in the area, it's cash only. Very few bubble tea chains boast the variety of toppings and flavors found at Gong Cha. Everyone has a different idea of what refreshing is, and the options here allow for anyone's ideal summer drink to come to life. There are milk foam teas, brewed teas, different types of boba and toppings like pudding, basil seeds and coconut jelly. This location also accepts cards and has some seating. There aren't many places selling bubble tea in The Bronx, but some locals really love the coconut tea and red bean bubble tea with extra toppings here. This shop also has yogurt boba and some green tea-based drinks along with the usual milk tea drinks. Nothing says summer like the fruit flavors that this Japanese restaurant has. Mango, cantaloupe and papaya feature among the many flavors here and unlike many Staten Island shops that sell bubble teas, this shop also has flavored tea drinks with mixed jelly. Some of their summery flavors include pineapple, lemon, passion fruit and guava.